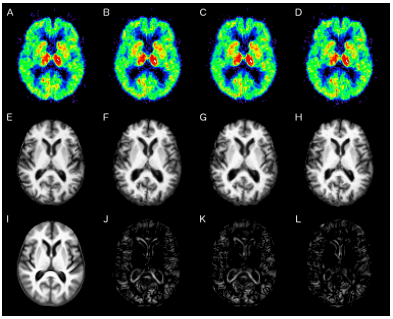 Figure 1: Visual comparison of deformed images for a sample subject. First row: PET deformed using (A) the deformation from MPRAGE-to-MPRAGE template registration, (B) the deformation from PET-to-PET template registration, (C) the deformation given by [J. Fripp et. al.] (D) the deformation predicted using the PLS model. Second row: MPRAGE deformed using (E) , (F) , (G) the deformation given by [J. Fripp et. al.] and (H) . Third row: (I) MPRAGE template, (J) difference of E and F, (K) difference of E and G (L) difference of E and H.
Figure 2: Root mean square (RMS) error (in mm) of the PET deformation fields, calculated across 79 subjects. Left to right: MPRAGE template, RMS error of , RMS error of the deformation given by , and RMS error of . 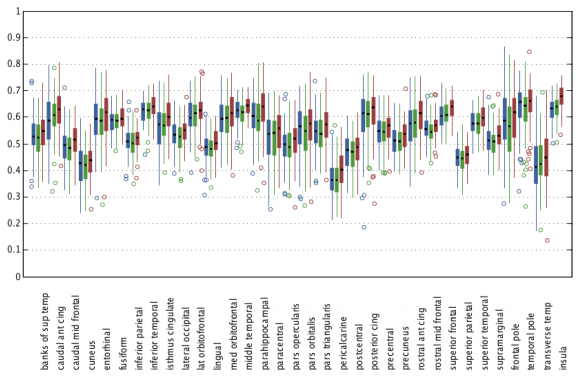 Figure 3: Box plots of Dice coefficients for cortical labels calculated using the deformations obtained from PET-to-PET registration (blue), the method proposed by [J. Fripp et. al.] (green), and our method (red). Dice coefficients for our method are statistically different (p<0.05 for cuneus, temporal pole, and transverse temporal and p<0.01 for all other regions) from both other compared methods. J. Fripp, P. Bourgeat, O. Acosta, G. Jones, V. Villemagne, S. Ourselin, C. Rowe, O. Salvado,, "Generative atlases and atlas selection for C11-PIB PET-PET registration of elderly mild cognitive impaired and Alzheimer disease patients", Fifth IEEE International Symposium on Biomedical Imaging (ISBI 2008), Paris, France, May 14-17, 2008.